Over at The Clay Aiken News Network, the question was asked - Clay Aiken, are you on the Moon? Can't believe it has been 40 years since man first went to the moon. Greta photo! Sue, this is so neat!!! I love your sense of humor and you ability to make us smile!! Thank you for the link to CANN!! I remember this day like it was yesterday. It was my 18th birthday!! Love the blog! Oh, Clay Aiken is hiding on the moon. I'll look closely!! I remember it too. It was so thrilling to see and hear "one step for mankind." Thanks for putting this on your Clay Aiken blog. 40 years ago, ten years before Clay Aiken was born. The walk on the moon was such a huge event. Your sense of humor is almost as good as Clay's. My last verification word was scarce with an 's'. Just like Clay - scarce. Well, now it all makes sense why Clay was peeking in and out at the OFC for three days without posting!! He kept losing service from the moon!! A very big step for mankind! 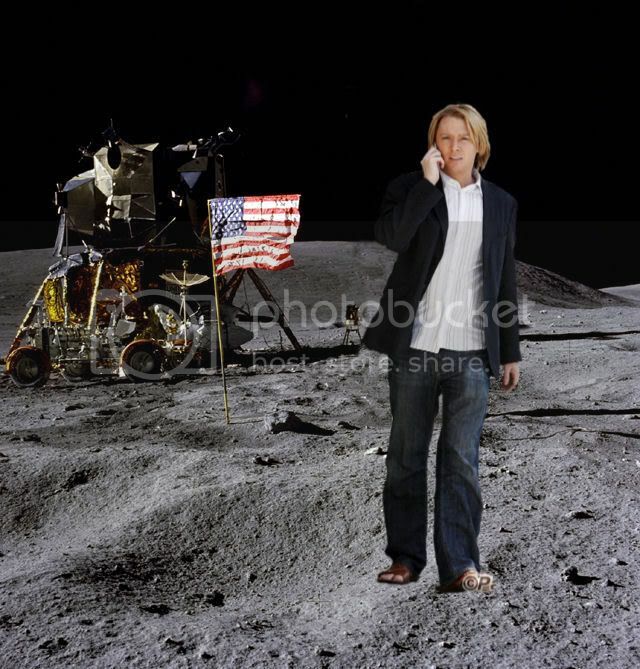 Yeah I do believe Clay Aiken is on the moon, hahahah, that picture is so cute. Well even if Clay Aiken isn't on the moon - I'm over the moon about the guy. Is this a Where in the World is Waldo game? Well, Clay Aiken IS out of this world!!!!!!! Clay is on the moon?? Well, I am glad he is having a good time. Where oh where is that man on the moon, Clay Aiken?? 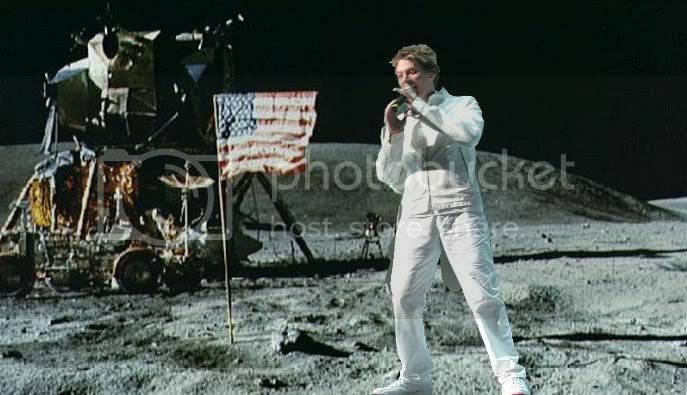 Oh My, Oh My, that Clay Aiken sure looks HAWT on the moon in his white suit! So does that mean he took his ipod to the moon and was answering questions at the OFC from there?! Thnx for your kind comments in the Carolina blog. Have an awesome week! Spamalot Asks For A Return Engagement!